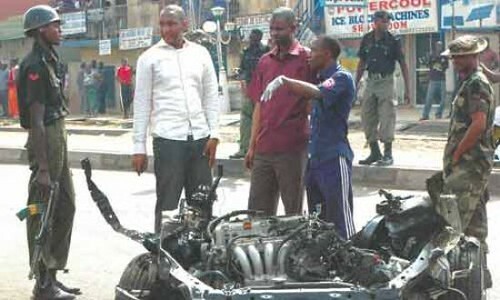 Nigerian city of Kaduna where cars were destroyed in bomb blasts blamed on Boko Haram. The conflict is ongoing inside the West African state., a photo by Pan-African News Wire File Photos on Flickr. SOME suspected Boko Haram sect members have attacked four villages on the Bama-Gwoza road axis, torching a primary school, quarry plant, and several houses in Kiva and Warabe communities where they killed three residents even as the military claimed to have carried out a major clampdown on the hoodlums. The gunmen, according to an eyewitness, also attacked Alafa and Pulka villages, 21 kilometres east of the Sambisa Forest and Bama township, 78 kilometres southeast of Maiduguri, the state capital. Speaking on the incident yesterday in Maiduguri, the Deputy Director of Army Public Relations, Captain Aliyu Danja, said in continuation with the ongoing military operations against the Boko Haram insurgency in Borno State, troops of 7 Division of Nigerian Army, supported by Nigerian Air Force (NAF) fighter jets have launched intense attacks on fleeing terror suspects in Alafa general area near the forest. He said the 30-minute joint aerial and ground bombardments in the affected area and Sambisa Forest hideouts, led to the killing of 56 terrorists, while others fled with gunshot wounds. On casualties of clashes, Capt. Danja said: “A lot of weapons, equipment and vehicles belonging to the terrorists were also destroyed by the troops on ground and from multiple air strikes of Alfa jets that reinforced the massive repulsion and killings of insurgents. Two of our soldiers sustained injuries in Saturday’s operations against Boko Haram insurgency in this state. “The multiple attacks against the insurgents at Alafa village and three others on the Bama-Gwoza road axis are part of the ongoing operations conducted by the military to ensure peaceful Christmas and New Year celebrations in Borno State,” Danja said.